An overwhelming number of fires seem to occur in homes in the US every year with approximately 3500 losing their lives and another 18300 getting injured. In addition to killing thousands, house fires destroy valued possessions and memories. In the US the estimated property damage per year by fire is about $1.5 billion. Preventing house fires and surviving them need not be construed as a matter of luck â€“ it is indeed a matter of planning ahead. Understand that children under five are curious about fire. They love to play with matches and lighters. They have to be taught that fire is not a toy but a dangerous tool. They should not be allowed access to matches or cigarette lighters. Keep them locked up out of reach of children. In the US, about a thousand senior citizens die in fires every year. It is sad that many of these deaths could have been prevented. As the elderly citizens are unable to respond quickly to fire, when they are caught alone, they are vulnerable and succumb to fire. Fire can start from – a smoldering cigarette, sparks from a ill-fitting appliance plug, burning oil in the kitchen, an overheated furnishing material carelessly draped near a heater or an unattended burning candle. It doesn’t always need an Arsonist. It doesn’t need to burst into flames from the start. It can smolder for hours and emit obnoxious smoke that can asphyxiate the occupants of the house. Carbon monoxide resulting from smoldering material can be a silent killer. This is the reason why we must invest in electronics alarms. Smoke alarms can be a simple light sensitive kind which uses a photo sensor to detect scattered smoke particles and this type is generally effective in detecting smoldering fire while the other type of Smoke detector â€“ Ionization type which uses a tiny radioactive isotope driven ionization chamber to detect flames. Every home must have at least one working smoke alarm. This is the least expensive protection that one can offer the family. And the smoke alarm must be installed at every floor of the house. For extra protection, smoke alarm can be installed in the child’s bedroom and in the bedroom of those who sleep with doors closed. Call a professional to install the smoke/fire alarm. They know the optimum location to install the alarms. Heated air always rises. Ideally your alarms should be placed where they can intercept any smoke from anywhere in the room. Kitchen and utility areas require smoke detectors on their own. One pertinent cause of home fires is an overloaded circuit or extension cords. Notice flickering lights, or intermittent power surges. These conditions might indicate a bad connection or short in the circuit. Check for breakers or fuses that trip or blow frequently. This is almost always a sign of an overloaded circuit or other wiring problems. In outdoor panel boxes, one has to look at individual breaker connections, for corrosion signs, thermal damage or splices which are poorly taped or damaged wires. The ground cable has to be checked. Failure in the building grounding system can be dangerous and lead to electrocution. It is vital not to place cords and wires under rugs, over nails or high traffic areas. Appliances that sputter have to be unplugged. Whenever there is spark or smoke emitted or an unusual smell, then it is better to shut the circuit off and call a professional repairer. Huge buildings and apartments have to be installed with a lightning protection system, especially if the area is prone to lightning. A person well experienced in electrical wiring, plumbing gas, heating, and air-conditioning must be recruited to inspect the house and suggest options to prevent house fires. It is imperative to keep the alarm regularly tested and dust free. Batteries need to be replaced at least once a year. The life span of a smoke alarm is about ten years. It is not enough to buy an appliance without knowing how to use it wisely. It is necessary to follow the manufacturer’s safety measures and precautions prescribed. For instance, over- heating, unusual smell and sparks are all warning signals. These indicate that the appliance has to be shut off or replaced or repaired. Unplug appliances when not in use. Safety caps have to be used to cover unused outlets. Take extra care, especially when children are at home. Home fire sprinklers can be used with working smoke alarms so that the chance of surviving a fire is greater. Sprinklers are affordable and they increase property value. Insurance rates are also lower with sprinklers around. Maintain the fireplace correctly and inspect the fire box for cracks, damaged sheet metal and other hazards. To prevent embers from popping out of the fireplace, glass fire doors or a wire mesh spark screen can be used. Clean chimneys annually. The creosote built up in a chimney can ignite a fire that can spread easily. Use kerosene heaters only when approved by authorities. It is recommended not to use gasoline or camp stove fuel. It is imperative to refuel only after cooling the heater. While in the kitchen and using a cooking range, do not leave the burners on and leave the room. Indeed most kitchen fires happen by unattended cooking. During cooking, when flames appear, especially while cooking oil, it is essential to keep a lid close at hand. The flames can be suffocated with the lid and immediately the stove must be turned off to let it cool down. Do not use water as the super heated water can cause severe burns. Nothing can be more foolish and dangerous than cooking when drinking alcohol or using drugs or when very tired. Natural gas and LP gas system at home have to be checked. Look for loose fittings, leaking valves and faulty pilot lights and debris or improperly stored flammable materials in areas near the appliances. And again, while cleaning the ash tray, the ashes must be placed in a sink and be dampened, and then scooped up and cleaned. They have to be placed in a trash can away from the house. The condition of the electrical system need be checked. While many modern appliances use a three pronged receptacle, some use an adapter to bypass this safety feature. They even break a ground prong off an appliance cord. Changing existing circuits to provide grounding is the job of a professional electrician. Sometimes, chances are that the attic and crawl spaces can have wiring that is damaged by pests and insects. Keep a tab of such spaces. Vents in stacks or gas water heaters, furnaces and clothes dryers, have to be checked. Automated ignition systems, pilot lights and fixtures should be properly installed. Check for any lint or dust built up in these areas. In case a leak is suspected, have a professional inspect the gas plumbing system. Similarly, the heating ventilation systems in air condition units have to be examined. Since these systems operate on electric motors and air moving equipment, they require periodic maintenance. Interior AC coils have to be cleaned and air filters replaced regularly. This will prevent the fan motor from being overworked and money on energy bill can also be saved. Listen when gadgets are operating. Squealing sounds, rumbling noises and banging or tapping sounds can indicate presence of loose parts or bearings that could be seizing up. While handling heaters, keep flammable materials like curtains, couch at a safe distance of at least 3 feet from portable heaters. Set heaters where they are not in the traffic flow of the room. Extension cords are not recommended with space heaters. It is better to be safe and not use extension cords. Space heaters need to be placed on solid firm surfaces. They should not be placed on tables, chairs or other places where they can tip over. Always remember to keep gasoline, paint thinners, and other flammable liquids out of the house in approved containers. Do not store flammable material in the garage or utility room that may have a pilot light equipped appliance in use in it. Be safe. Keep such items outdoors in a separate building. Be careful while using candles, oil lamps and other open flame illuminations / decorations. Extinguish the fire when leaving out of the room. Relight the candle, when you are back in the room. Even with holiday decorations, such as a Christmas tree, use abundant caution. Natural Christmas trees can be highly combustible when they become dry and old and damaged and low quality tree lights cause fires combined with an under watered or otherwise dry tree. This can even destroy a room and a home in a jiffy. Frequenting lawn chopping near a building can build up the heat and catch on fire. Barn fires are famous and bales of hay with no electricity can fire a house. While not at home or on travel, use crates to prevent new dogs or puppies from chewing on electrical cords, confine new cats to a safe room with no place to crawl to hid into a refrigerator motor or electrical cords. Many equipments use Li-ion Batteries as they are more efficient and possess better power to weight ratio. But unless they are charged by their manufacturer approved chargers, they can start a fire. Mobile phones, tablets and Laptop computers have Li-ion or Li-pol batteries which can cause explosion or fire when they are shorted or used in high temperatures. Do not operate a Laptop placing it in a bed. The air vents may be blocked by the bed resulting in raised temperature. Use a flat cradle or a Laptop stand for long hours in the bed. Invest in suitable Fire extinguishers approved by your local fire department. Extinguishers are classified based on the kind of fire classes. Portable extinguishers can put out small fires if initiated early. Do not underestimate the size of the fire and try to put out fires on your own. Above all, if at all a house fire occurs; practice a home escape plan with children and family. It is better to practice an escape plan from every room of the house. Choose a meeting place outside the house and make sure everyone knows to meet there. Reinforce the ‘stop, drop, cover and roll drill’ in case children’s clothes catch fire. Let everyone stay low to the floor while escaping from fire. It should be ‘get down low, and go, go, go’ principle. Never open doors that are hot. It would be wise to select a location when everyone at home can meet after escaping the house fire. Better to get out and then raise a call for possible help. From kitchen stove to a romantic candle-lit dinner, any common household item can turn dangerous very quickly. 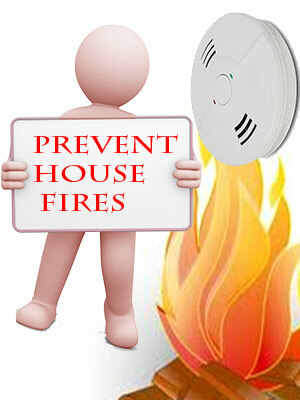 Learn to prevent fire and practice safety by simply following the prevention tips suggested. It is not worth risking your life and that of your loved one.